The Volca synth is revolutionary at this price point. Everybody should own one! Sound as good as more expensive analogue synths. Super compact, well built, can be battery powered. Crazily its considering their power/features. No standard MIDI out. No included PSU. Korg's Monotron series/ Monotribe have really helped put analogue back into the hands of those on smaller budgets and as a result of their popularity, Korg is now moving firmly forward with more new analogue-based products. Many have lusted after a new TB303, TR808 and MS20 for years, yet none of the big companies seemingly had the desire to go there - that was until Korg broke the mould and released the MS20 Mini at under half the price of the original! "Control signals are generated digitally whilst the CPU has a 10-bit DAC giving incredible near-analogue resolution"
Volca Keys was designed in Japan and built in Vietnam and has a 'full analogue signal path'. However, as Korg explained to us, the "control signals are generated digitally" whilst the "CPU has a 10-bit DAC giving incredible near-analogue resolution". We can happily attest this to be the case, though the filter in the Keys does step slightly when swept at high resonance settings. Essentially, this is a hybrid unit; an analogue sound engine with digital control so dial tweaks and note info can be recorded into the sequencer/accessed over MIDI. 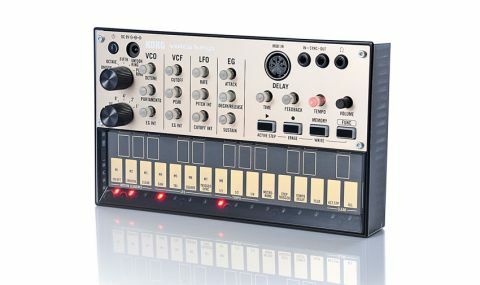 Several parameters on the front of the Volca have a MIDI CC and can be addressed via a MIDI controller. For example, you can control filter cutoff (though not resonance) and delay time. The sequencer on the Volca is limited to 16 steps, though you can make longer sequences by using it as a sound module/sequencing from your DAW. Real-time recording is possible (all steps are auto-quantised except for 'flux' mode on the Keys). It can store eight sequences and although there's no sequence chaining, sequence loading from memory is instant. It's housed in a translucent plastic case (you can see the inner workings/LEDs flashing) with a metal front panel and is approximately the size of a VHS cassette, making it perfect for 'go anywhere' production. It can be battery powered or by a wall-wart, though no power supplies are included and currently there's no Korg solution to power multiple Volcas together, so factor this into your budget. The dials are lifted from the Monotron, with pretty much a dial per function. Build quality is a big step up - everything feels tight/sturdy and ready for some serious abuse! You'll notice that some dials are translucent and some solid. As a rule (some exceptions) the solid dials' movements can't be sequenced, whereas the translucent dials can be sequenced and are backlit red plus flash to denote which parameters are active or recorded in a 'motion sequence' (motion sequencing captures dial movements into the sequencer on the Keys). The tempo dials flash in time with the internal/MIDI-clocked tempo and each key/sequence step has its own LED too. These let you know what's happening at a glance within complex sequences. Happily, the LFO syncs to master tempo/beat divisions/MIDI and can be re-triggered by note-on information. "There's Sync in/out which uses 5-volt audio pulses to sync one Volca to another"
Connectivity on the Volca is limited to a shared stereo mini-jack for headphones/main out, though the audio signal itself is mono and you'll need adaptors to interface with 1⁄4-inch jack-based studio gear. There's also a din MIDI input for triggering from an external MIDI device/clock (such as a DAW or controller) and there's Sync in/out which uses 5-volt audio pulses to sync one Volca to another (cables provided). Apparently there's no limit on how many Volcas you can chain this way for clock sync but without a third party MIDI out mod, there's no way to build a monster polysynth (using three Volca Keys for example) as sync doesn't transmit note-on/off info. This aside, we tested syncing the sequencer of the Volca to Logic's (and our DSI Tempest's) MIDI clock and everything worked flawlessly. Also, when you slave one Volca to MIDI clock, you can then clock all other connected Volcas to this master using sync cables and this works great, though if you use one Volca as the master and connect other Volcas, when you press play on the master, be aware the sequencers won't start on the others until you press play on each respective unit. Like the Monotron and Monotribe, the Volcas can be modded and expanded, though this does void your warranty. People are already modding them for MIDI out and CV control. However, they're trickier to work on than the Monotron/ Tribe so be careful with that soldering iron! Handily, Korg have again labelled up the key PCB solder points (MIDI out, kick out etc) underlining how in touch they are with their user base. It's essential (if you use an iOS device) to check out Korg's free SyncKontrol App. Connect a sync cable from the headphone out on your iOS device to the Sync In on your master Volca and you can start/stop the sequencer(s), set tempo or add swing. This last point is important, as there's surprisingly no swing parameter on any of the Volcas. Also, SyncKontrol's swing is pretty jerky at higher percentages (though it's great for making twisted/broken beats) so we hope an improved app or a 'swing mod' might appear! Volca Keys uses saw/ square waves and excels at upfront three-note chords, dirty lead/bass lines, ring modulated sounds and detuned unisons. It also features octave/fifth mono modes, a versatile tempo-syncable analogue-style delay that does reverbs/bit-crushing (from the Monotron Delay) freeform unquantised flux recording and 1/1, 1⁄2 and 1⁄4 tempo modes. The sound drives when pushed and it can produce killer basses too. It uses the MiniKORG700s filter (voiced differently to its Bass sister model) and there's a single ADSR envelope. The biggest downside is that when sequencing chords, you can't edit the individual notes in the chord as the sequencer only has one track and as there's no step edit - on the fly erasing is your only option if you mess up. Inputting notes and beats into the sequencers on the Volcas is done via the 'multi-touch' keyboards (or via MIDI) and it's surprisingly easy to play accurately in the main (way easier than the Monotron/Tribe). However, to get the best out of a performance/ sequence (and particularly when playing chords on the Keys) we advise connecting an external MIDI keyboard. The Keys responds to velocity over MIDI and all the Volcas react reliably to MIDI note input. Each unit can also have its own MIDI channel but there's no multi-timbrality on any Volca. "The balance between functionality, ease of use and playability is great"
Also, in conjunction with the Func button, the keys double as function buttons to access secondary functions and this system works well and is easy to learn. The balance between functionality, ease of use and playability is great and it's amazing how much has been crammed in for the money. So how does it sound? In a word - great! You have to keep reminding yourself that this costs just £119! Whilst the tiny speaker kicks out a surprising punch you realise how serious the Volca sounds once it's plugged into your studio monitors or a big system. The raw tones are up there sonically with synths/machines costing a lot more. The one downside here is that the Volca has quite a low-level output and you often need to jack your mixer gain to get it loud enough. This tends to magnify background noise in the circuitry, so you need to be careful with your gain staging. This aside, the lows are chunky and the highs on the Keys are upfront/raw and sizzly. All things considered, Korg has done itself proud and it's set a new benchmark for sound/features at this price point. We can even see the Volca eating into the sales of more expensive synths. The sequencer feels tight and it's perfect for one-man shows, for introducing kids to the fun of production (this writer's daughter went crazy for them! ), for live instrumentalists/ vocalists wanting backing machines/ analogue sound modules and for producers that are tight on space but want quality keys without breaking the bank. The Keys really packs a lot in and it's very versatile. The modding possibilities are a real bonus and Korg also mentioned to us that it's prototyping a combined case/stand to hold all three Volca's. Of course at this meagre price there are compromises including no standard MIDI out, no combined/ included PSU(s), no audio in, no swing, no way to copy tracks and no pattern chain. Regardless, we're really digging Korg's direction right now and we hope it inspires the other big manufacturers to step their games up and get back in touch with what their customers want. These are deservedly going to sell by the boatload and we can only imagine excitedly what Korg has in store around the corner.